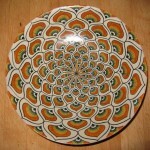 Majolica is a type of ceramic dating from the Italian Renaissance. It is special in that it is tin-glazed which provides a special lustor to the work. 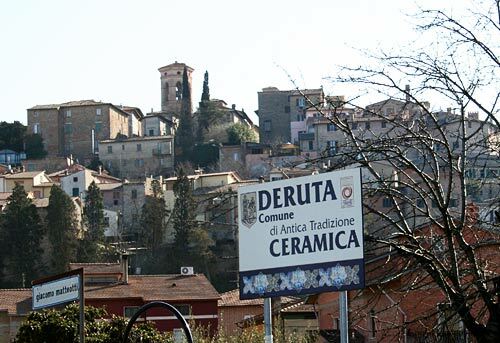 It is really an art form in Italy and is found all over the place but Deruta, in Umbria is a town almost totally devoted to this particular ceramic. The town can seem a bit tacky actually but there is some really great stuff there. Of course that leads me to a story. In the process of moving in January I ran across a bunch of stuff that hadn’t seen the light of day for years. That’s what happens after living in one place for over 13 years. 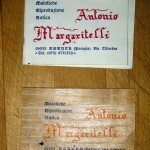 One of the things (well, two actually) was the pair of business cards from a Deruta. Both are from the same guy, Antonio Margaritelli. I met him the first time that I was there in approximately 1989. He was outside the studio drying some small ceramic pieces on wood set up over saw horses. He invited me inside to look around. He was amazingly enthusiastic about his work. 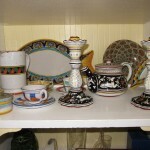 He showed me historic pottery shards that he kept in a file cabinet, a shelf full of books on majolica. He dragged me down to his lower level workshop to show me around and showed me a portfolio with pictures of his work. There was a fireplace in Switzerland, a fantastic table in Germany. He was quite a guy and we had our picture taken together. I took that photo with me 7 or 8 years later when I knew that I was going to be in that part of Italy. He was delighted with the picture, commenting that he had more hair then. Of course I let him keep it so now I would have to scrounge through old negatives to find it. I really wanted to get a couple of candlesticks so we went searching through his storage area looking for the unpainted ceramic pieces. We found some that would be suitable but then he said that he could have them ready for me in only a month. So I didn’t get them but I certainly remember his enthusiasm and talent. You can Google him and see some fine examples of his work. His 16” plates now go for over $1500 – wow! I was fortunate enough to buy two small shallow bowls when I first visited his shop. 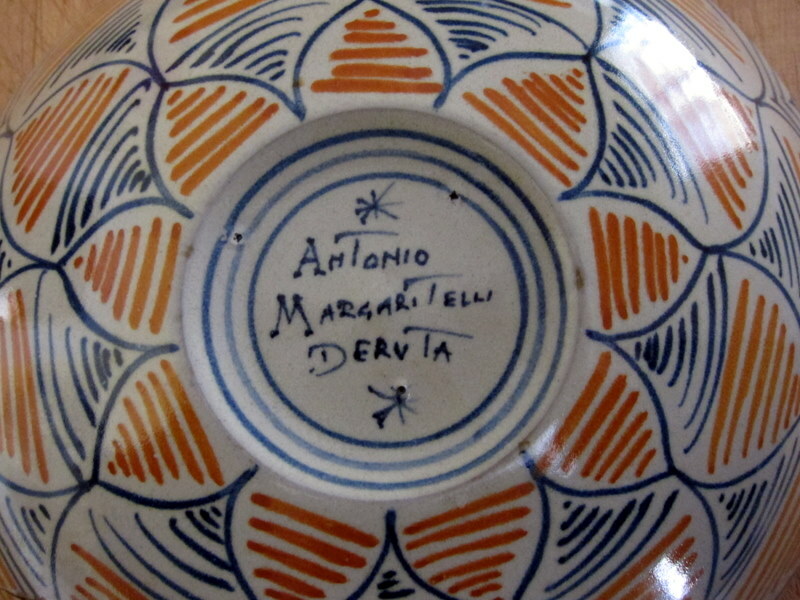 When I did the Google thing for him I found a roughly identical bowl priced at about $500. Not the kind of bowl for salted nuts. The second bowl is, sadly, in pieces. I think that all of the pieces are there and that I will have it restored before too long. 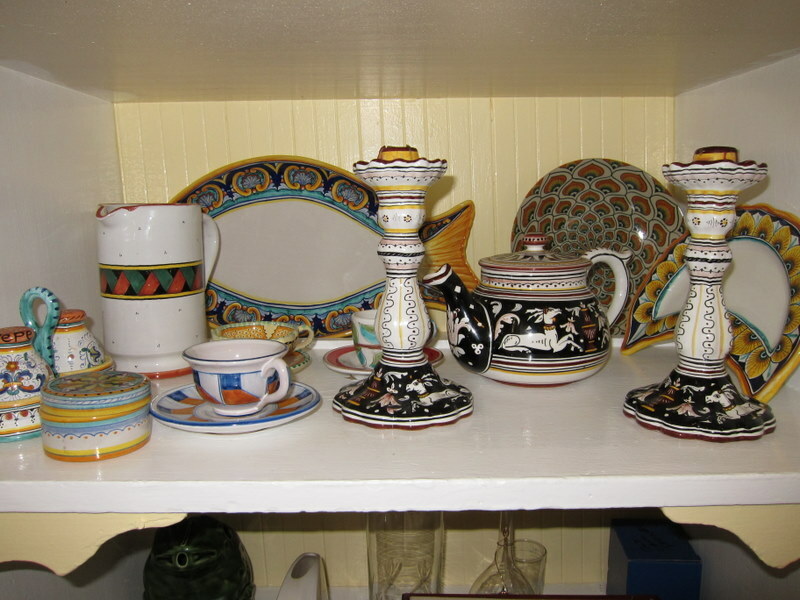 Part of my majolica collection. I also have some things from Sienna (the candlesticks and teapot in the photo). The traditional style there is quite distinctive and different from the Deruta traditional styles. While I’ve not studied the styles in any detail I’d guess that this is pretty much true for any area where majolica is made. While it is great to buy such things in Italy you can certainly find them here. 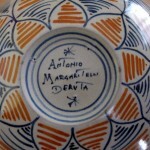 I have several things that came from Biordi Art Imports in San Francisco and recommend it if you are in the city. This entry was posted on Tuesday, May 3rd, 2011 at 5:28 pm	and is filed under Culture, Travel. You can follow any responses to this entry through the RSS 2.0 feed. You can leave a response, or trackback from your own site. Nice. 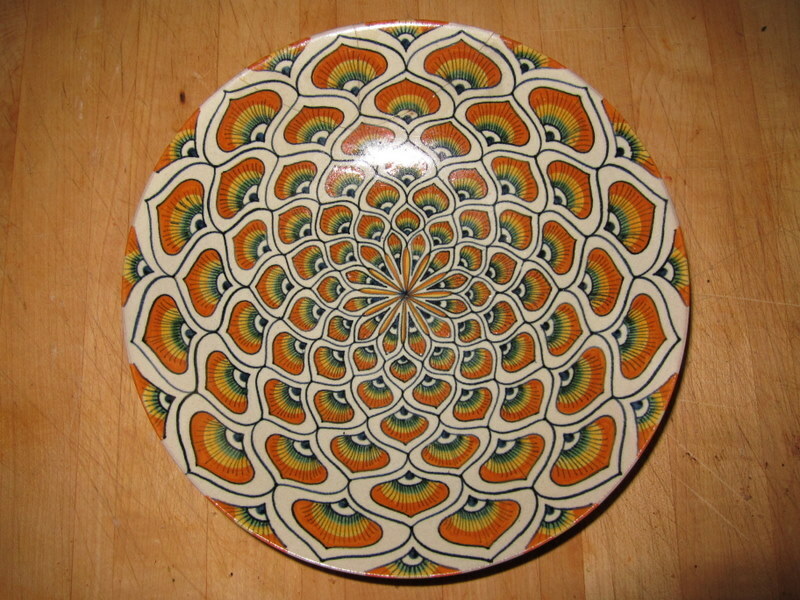 I love majolica. Unfortunately I got mine while my boys were still teens and they used them for entertaining one time when we were gone (really – it’s a miracle they made it through their teens alive). I have yet to replace it. The most beautiful majolica I believe I’ve seen was 4 years ago on Capri Isle, in the Chiesa Monumentale di San Michele. The floor of the Chapel is all Majolica. There is a boarded path around the edge to walk on and explore the designs, however it’s worth the trip up the very narrow (rather treacherous) spiral staircase to see the entire room from above. Fantastic! This link gives you a decent view here: http://www.chiesa-san-michele.com/lg/en/main/pav/flash.htm. Enjoy! Teenage boys (and probably girls for that matter) don’t seem to realize the value of fine things. I suppose that I was the same way. Sorry to hear about your loss of that majolica. I went to your link and took a look at the floor. It is quite fantastic. Can I purchase bowl. Italian dreaming. No, it’s invaluable to me.